Hemorrhaging is not something that we want to think about when it comes to giving birth. Ninety-five percent of births will not have a problem with hemorrhaging of any kind. However, it is important to know the risk factors for hemorrhages and discuss your personal risk factors with your doctor or midwife. Postpartum hemorrhage is defined as a loss of blood in the postpartum period of more than 500 mL. The average, spontaneous vaginal birth will typically have a 500 mL blood loss. In cesarean births, the average blood loss rises to between 800 and 1000 mL. There is a greater risk of hemorrhage in the first 24 hours after the birth, called primary postpartum hemorrhage. A secondary hemorrhage is one that occurs after the first 24 hours of birth. There are certain risk factors that make a postpartum hemorrhage more likely to happen, including multiple gestations (twins, etc. ), a very large singleton baby, or in a woman who has had several prior pregnancies. There also are several medical conditions that can contribute to postpartum hemorrhaging as well, including polyhydramnios (excess amniotic fluid), placenta previa, or placental abruption. These are all situations about which your obstetrician will need to be aware or consulted. 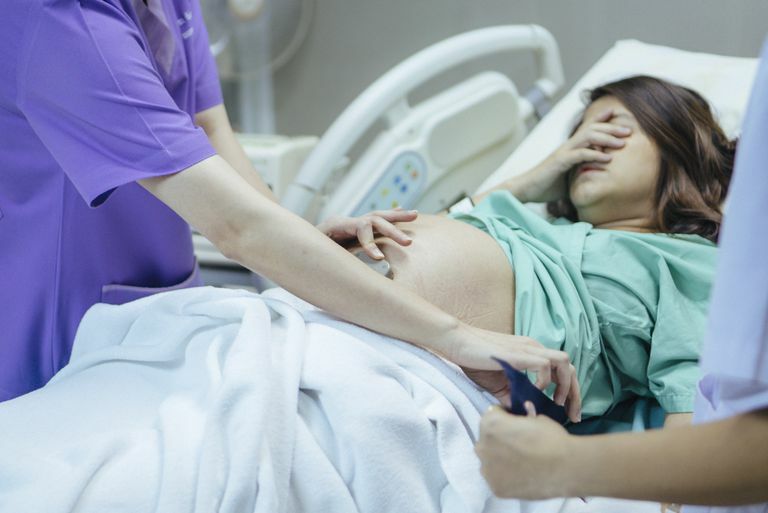 In addition, women who take Pitocin to induce labor may be at greater risk of postpartum hemorrhage, or those who are put under general anesthesia during pregnancy. And if magnesium sulfate is given as a treatment for preterm labor, that also can increase the risk of postpartum hemorrhaging. It's important to note that these risk factors can make it more likely, but are not certain indicators of hemorrhage. Knowing that there are greater risks for some may make certain precautions more necessary than for low-risk women. In the majority of cases, the cause of hemorrhage is uterine atony, meaning that the uterus is not contracting enough to control the bleeding at the placental site. Other reasons for a hemorrhage would include retained placental fragments (possibly including a placenta accreta), a trauma of some form, like a cervical laceration, uterine inversion or even uterine rupture, and clotting disorders. If hemorrhage does occur there are several steps which can be taken to treat the bleeding, steps used depend on the reason for the bleeding, including uterine massage, placing the mother's feet above her heart, giving the mother oxygen, giving her medication to stop the bleeding, or in extreme cases, surgery, which can include a hysterectomy (removal of the uterus). All women will receive care to help prevent hemorrhage after the birth of their baby. Immediately following the birth of the baby, signs of placental separation will be watched for to know when the placenta is ready to be delivered. Some hospitals and birth centers choose to give every woman a routine injection of Pitocin to help prevent hemorrhage and to help ensure that the placenta comes quickly and easily. However, many choose a more natural route, which is to wait and see if there is a bleeding problem. Many also encourage the American Academy of Pediatrics recommendation of breastfeeding beginning as soon as possible after birth. This allows the mother to secrete her own oxytocin to help contract the uterus and expel the placenta. Massaging the uterus is also done to help expel clots of blood. It is also used to check the tone of the uterus and ensure that it is clamping down to prevent excessive bleeding. Poor tone of the uterus at this point causes 70 percent of postpartum hemorrhage cases. This can be uncomfortable to painful. Be sure to utilize any and all relaxation and breathing techniques and not tense your abdominal muscles. If it is too painful, medications can also be used. This will be done with decreasing frequency after the birth, as your bleeding slows. Ensuring your bladder is empty will also help you avoid hemorrhage. Simply emptying the bladder in any manner can do this. Women who have not used regional anesthesia can usually use the restroom themselves within the hour after birth. Those who had regional anesthesia can use the restroom or bedpan in varying time increments, but usually within an hour of the anesthesia wearing off, unless a cesarean was performed. Catheterization can also be of benefit here. Talking to your practitioner to see which after birth protocol he or she uses and what might be best for your situation can go a long way in helping you to understand your personal risk factors and prevention strategy for postpartum hemorrhage.